You can add titles to a chart to help describe its purpose. By default, titles are not added when you create a basic chart, but you can add them later manually. In addition to a main chart title that is generally displayed above a chart, you can add descriptive titles to the x-axis (category axis) and the y-axis (value axis). Click the Chart Title button in the Labels group of the Chart Tools Layout tab. None: The default choice; it means you don’t want to display a title. Also use this option to remove a chart title you don’t want. 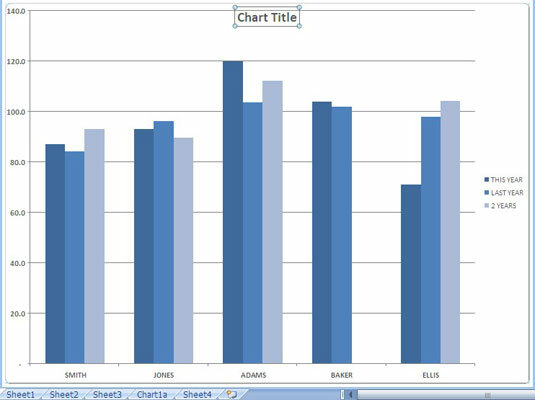 Double-click Chart Title and drag across the words Chart Title. The text you type replaces the words Chart Title. Click anywhere outside the chart title to deselect it. (Optional) To add an axis title, click the Axis Titles button on the Chart Tools Layout tab and then select the axis and the type of title you want to add. Repeat Steps 4–6 to edit the axis title.